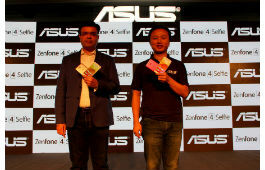 Asus launches ZenFone 4 Selfie Series in India Today. The new series available for Sale Exclusively via Flipkart.com from September 20 and comprise three selfie focus smartphone, ZenFone 4 Selfie and the ZenFone 4 Selfie Pro. Interestingly, the ZenFone 4 Selfie is available in two variants in India. The new basis version (Model no ZB553KL) comes with single front camera (Model no ZB553KL) and the later one comes with dual front camera (Model No ZD553KL). In India, Asus ZenFone 4 Selfie Pro available at the price of Rs. 23,999, the ZenFone 4 Selfie (ZD553KL) priced at Rs. 14,999, both the smartphones comes in Sunlight Gold, Rouge Red, and Deepsea Black colour and the last newly launch smartphone ZenFone 4 Selfie (ZB553KL) will cost Rs. 9,999 and comes in Sunlight Gold, Rose Pink, and Deepsea Black colours. All the Smartphone will go on Sale Exclusively at Flipkart starting from September 21. As a special launch offer company offering 100GB of additional Reliance Jio data with Zenfone 4 Series smartphones. Additionally, Flipkart will offer attractive exchange and assured Buyback Guarantee across all the three variants from the ZenFone 4 Selfie series. During Flipkart's Big Billion Sale company offering Flat Rs 1,000 Rupees discount on ZenFone 4 Selfie (ZD553KL) i.e. from September 21st to 24th Zenfone 4 Selfie dual front camera phone will be available at Rs 13,999/- only.